"Sideways," a Thursday afternoon wine-tasting party, debuted at Spada Bar & Restaurant on July 20. Several dozen adventurous people tasted wines form California, Washington, Italy and New Zealand, and enjoyed a dinner-quality Italian pupu buffet. "Uncle Tom" Moffatt of Oldies 107.9 was the emcee. Country music recording artist Dita Holifield attended with John Michael Dimitrion, principal broker of Mortgage Alliance, and his wife, JulieAnne Baldueza Dimitrion, general manager of the Honolulu office. The company is the local sponsor of the Mortgage Alliance Colgate Country Showdown, a national country singing contest with a record deal as the grand prize. Holifield, local coordinator of the contest, debuts on morning drive radio in August on a new country music station, AM 690 KHCM. "Sideways" was planned for the last two Thursdays of the month but has been so successful that it is continuing this Thursday from 5 to 7 p.m. Tickets are $20 in advance, $25 at the door. Call 538-3332. JulieAnne Baldueza Dimitrion, left, John Michael Dimitrion and Dita Holifield near the Spada waterfall. 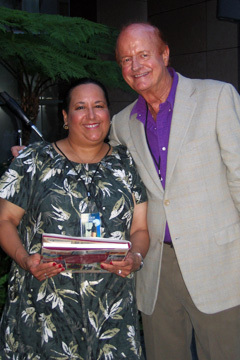 Priscilla Bode won a copy of "Uncle Tom" Moffatt's autobiography, "Showman of the Pacific," at the event. 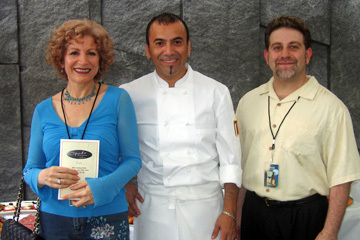 Spada chef Antonio Lee, center, with restaurant owners Sharooz Noubari, left, and Nima Noubari.